Tucked beneath a railway arch, Bermondsey Social Club is definitely one of the most unusual party venues for hire in South London. The location and vibe of this space makes it the perfect getaway from the hustle and bustle of the big city. Want to party till dawn? Then this is the place to go. Bermondsey Social Club is licensed until 4 AM, seven days a week! The venue is open to host events of all kinds, from wedding receptions and birthday parties to pop ups, gigs and photoshoots. It works wonderfully as a blank canvas space and allows external catering so you can really put your stamp on things. The Main Room makes a great place to dance the night away, while the Outside Space is perfect for celebrating these long summer nights. Bermondsey Social Club is an 18+ venue and does not host 18th birthday parties. Space for up to 140 people and approximately 1200 sq feet combined, full of unique features, the Social offers a fantastic blank canvas to suit all. Bermondsey Social has the capabilities to host a wide range of events from private parties, corporate events, live music shows, pop up shops & restaurants, product launches as well as film/photo shoots. BSC has a license until 4am and is equipped with a fully functioning bar, a top-of-the-line audio system, industry-standard DJ equipment and lighting rig incl. a projector. We allow external catering. Tucked away in a quiet street the space has a sense of privacy and a real get away from the hustle and bustle of Central London. We boast to have one of the finest, most secluded outdoor areas south of the river. Where the train lines splits our idyllic outside courtyard sits. 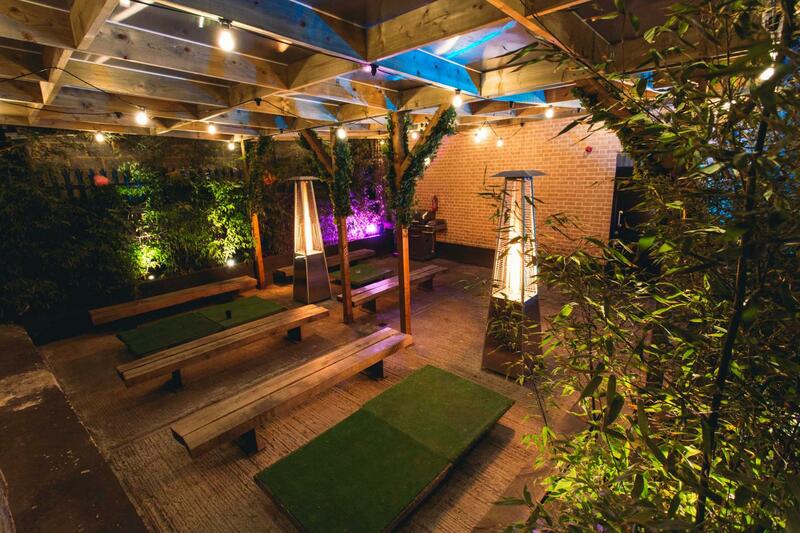 A real hideaway with a secret garden, BSC is ideal for private parties and much more. The BSC is an amazing place to host an event! The staff are friendly from start to finish and the booking process is fairly simple. I hosted my 25th birthday party and i'd do it all over again at the BSC! P.s I cant get enough of the hospitality, the security men were friendly and the bar staff were phenomenal! :) I highly recommend the BSC, I know i'll be back! The location is hard to find but when its found its amazing. The bar spend is quiet high but other than that it is an amazing place to hire. Parking is limited but after a certain time roads nearby are free to park. Fantastic communication with the manager. Fantastic bar service, security service and great location! Many thanks!! GREAT VENUE, LOVELY TEAM/ STAFF - you won't regret booking here! To be honest, there wasn't anything not to like - had a brilliant 30th birthday party! After my initial inquiry was unsuccessful as the venue had been booked over my proposed date, Theo (manager) took the initiative to get in touch again to let me know that it come free for my 30th birthday party date. He met me at the venue at very short notice and was only too happy to show me around and talk me through all the facilities. Theo was also great on email thereafter - checking in re. whether I wanted drinks on arrival, DJ equipment set up on the night etc. On the night itself, Jake and his team couldn't have been more friendly or helpful. Jake himself held the ladder whilst I strung bunting from the lamps and were just a lovely presence all night - smiling and dancing whilst serving everyone. Maria was great on the door - we didn't have to worry about any gate crashers as she and her colleague checked everybody in on arrival. The only reason I've taken a star off on location front is just because it's a little walk from the tube and down quite an industrial street. I personally like that about the place - it feels out of the way and a well-kept secret but worth flagging if you've got guests arriving on their own in the dark. Theo, Jake and all the staff I dealt before and on the night were absolutely brilliant. Helpful, accommodating, friendly and wanting to do their best to make my night special. Jake and the bar staff on the night were enjoying themselves with us and just made the place feel like I was having a party in my own home. The venue itself was perfect for what I wanted. Great space inside and out and use of a big screen and DJ equipment. I can’t say enough good things about this place. Highly recommended. My friends and I just had the BEST night! Thank you guys for making my 40th birthday so special. The only downside (which was nothing to do with the venue) was that the caterer let me down on the day and I had to find an alternative with only a few hours notice. The agency that the venue use for catering ended up finding a great alternative in the end but it’s not the kind of stress you need on the day of the event! Had my 25th b day party here and had the best night. Staff were friendly and helpful, and the venue was perfect for a 80-100 person party. Would highly recommend! The whole night was absolutely fantastic, everything ran smoothly and the bar and security staff were amazing! Everyone had such a good time and the venue looked great. I had an amazing birthday so would like to thank everyone who made it great! Friendly staff, excellent set up. Highly recommended! Card machine faulty on night - guests not allowed out for up to hour to get cash. Min spend not met - told we didn't have to reach on night - diff story Mon. Fault machine all at our expense. Very upsetting end to what was a good night.